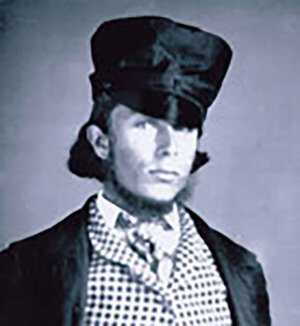 Theodore Judah and the American railroad matured together. As a boy Judah studied civil engineering. By 18 he was a railroad surveyor, giving himself a practical education in technology not even two decades old. At 21 he married Anna Pierce. The couple leapfrogged across the northeastern states in pursuit of railroad jobs. Engineers were in high demand in the late 1840s, with tracks spreading across the countryside like creeping vines. In 1854 Judah found himself invited to a New York meeting. Returning home, he informed his wife, "Anna, I am going to California to be the pioneering railroad engineer of the Pacific coast." His enthusiasm earned him the nickname "Crazy Judah," but by 1856 Theodore Judah and his men had built the Sacramento Valley Line, the first railroad west of the Missouri River. His wife would remember that all the time Judah was preoccupied with dreams of a bigger project: building a great Pacific railroad. Nominated by California's 1859 Pacific Railroad Convention, Judah traveled that year to Washington for a crash course in lobbying. He returned having planted the seed of transcontinental prospect in the minds of many congressmen. However, the experience convinced him that the railroad must be built by businessmen and not legislators. He would not go back without a route survey and an organized concern. Proponents of a Pacific railroad had long pondered the riddle of the Sierra Nevada, the rocky barrier any route to the Pacific would inevitably surmount. 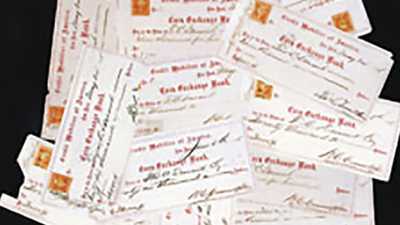 In July 1860 Judah received an invitation to climb Donner Pass from Dutch Flat storekeeper Doc Strong. The route over the pass was the easy, continuous rise a steam locomotive needed. Looking east from the summit named for the ill-fated Donner Party, Judah knew he had found his answer. Whereas most of the Sierra was double-ridged, meaning railroaders would have to construct two difficult ascents for their track, Donner Pass was not. The Pacific road could climb straight to the pass before following the Truckee River down out of the mountains. Judah had found his route. Investors soon followed. 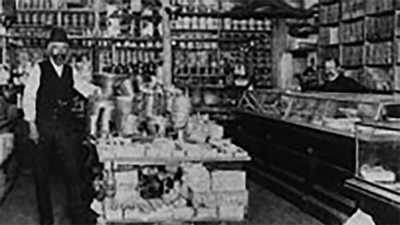 In Sacramento, storekeeper Collis Huntington attended a presentation by Judah, and invited the engineer to meet privately at his store. Huntington offered to invest $1,500 in the scheme, and he brought in four businessmen who would do the same: Mark Hopkins, Leland Stanford, Charles Crocker, and James Bailey. Though Judah had little cash, Huntington guaranteed him an equal number of shares and a place on the company board, which grew to include Strong. In April 1861 Judah and a surveying party, including Strong, set out to officially chart the route through the Sierra. Anna joined them in June. The next month Theodore returned to Sacramento to prepare his papers, producing among them a scaled Sierra route map some 90 feet long. In October he left for Washington as he had intended, with financial backing and the route map in hand. On July 1, 1862, when President Abraham Lincoln signed the Pacific Railroad Act approving construction, Judah famously telegraphed his partners, "We have drawn the elephant, now let us see if we can harness him up." But as construction progressed in 1863, the engineer gradually became alienated. He felt his partners' moral flexibility compromised the visionary nature of the enterprise. It also contradicted Judah's engineering. Tensions mounted as the businessmen consolidated their influence, leaving Judah in the dark as to their decisions. In July, Huntington insisted that board members pay the remainder of what they owed the company for stock. It was a necessary measure, he said, to keep construction running. Hopkins and Huntington could manage the sum. Theodore Judah could not. It looked to the engineer that his interest in the Pacific railroad might be pulled out from under him. In October of 1863 Judah set sail for New York to find financial backers to buy out his co-founders. While at port in Panama he became seriously ill. At the end of his voyage, he was carried from his ship to New York's Metropolitan Hotel, where he died in Anna's arms on November 2nd. In following years, the Central Pacific Associates hesitated to give Judah credit for introducing them to the railroad project. However, on May 8, 1869, Sacramento saluted Judah's name. Two days later, May 10, saw the completion of the project which Judah had inspired, and in which he'd so deeply invested himself. Anna Judah marked the events of that day in silence, for it was also the anniversary of her marriage to Theodore. She would recall, "It seemed as though the spirit of my brave husband descended upon me and together we were there unseen, unheard of by man." 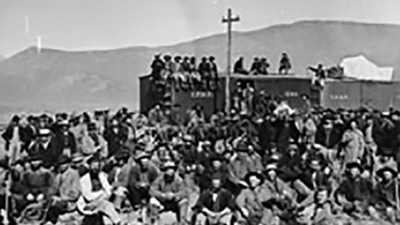 On May 10, 1869, as the last spike was driven in the Utah desert, the blows were heard across the country. Earnestness and frugality combined with a slight gray beard to earn Hopkins the nickname "Uncle Mark." But the unthreatening exterior disguised a resolute mind. Thomas Durant hired himself to construct the railroad, paying Crédit Mobilier with money given to the Union Pacific by government bonds and risk-taking investors.